Germantown, MD – February 29, 2008 See Dirt Run! 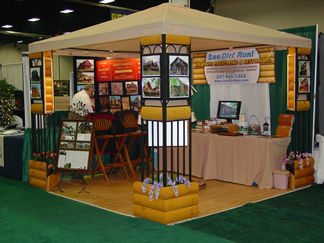 ™ Inc. of Germantown, MD, a local power washing company specializing in wood restoration and wood preservation, are participating in The Log Home & Timber Frame Expo held in Fredericksburg, Virginia from February 29th through March 2nd, 2008. See Dirt Run! ™ Inc. is exhibiting in a 10×10 booth custom built by the owners for the event. Information about pressure washing, chemical stripping, cob blasting, staining and sealing and chinking log homes will be available for attendees. Samples of work will also be available and on display for home owners. Both Roderick Rodriguez, President, and Beth Borrego, Vice President are available for consultation during the eventï¿½s show hours. See Dirt Run! ™ Inc. is located in Germantown, MD., and has been in business since 1999. The company specializes in wood restoration and preservation, and is an active certified member of PWNA. See Dirt Run!™ Inc. is also a member of the Better Business Bureau, and operates under MHIC License # 86481.